Before the 1999 RWC final at the Millennium Stadium, I came across Bob Burke, the father of Matt Burke, the Wallaby fullback. We chatted about the coming game. Bob noted, as a proud father does, that he didn’t think his son was getting the sort of recognition for his sterling play in the team that others were getting from the rugby media. And in the final, Matt Burke did not let anyone down. He was my player of the match, and I said so in my match report for the SMH: “For the Wallabies to win, Matt Burke had to kick goals. Goal-kicking, like putting in golf is sometimes the easiest or the most difficult of tasks. Hundreds of players can kick goals from 40 metres out. But only the most talented and nerveless of kickers can make a shot when a stadium holding 72,000 spectators, most of them hostile to you, is resounding with roars of outrage against the referee and the goal-kicker. “Burke kicked nine from 11 shots under the most intense pressure, one of them a conversion from the sideline, to put the Wallabies three scores in front and ensure victory. He did it elegantly, too, in keeping with Hemingway’s dictum that style is grace under pressure. This reference to the fabled fields of Hunters Hill remains a strong memory, especially a First XV match between St Joseph’s and Sydney Boys High School, who were going through a good period under the tutelage of their dedicated coach, Tony Hannon. The year before at Moore Park, Sydney Boys High had the effrontery to beat Joeys. So, with sons Zolton and Zac (both students at Sydney Boys High), we went out the next year to Hunters Hill to see whether this wondrous victory could be repeated. The match itself was a walk-over, 76 – 0 to Joeys. I told the boys we were lucky to get 0, so well did Joeys play. And the star was Matt Burke, the inter-coll sprint champion, opening bowler for the First XI, an old-fashioned all-round sporting star, especially at rugby. With this introduction to his play, I followed his career with something more than just a professional interest as a rugby writer. What I noticed about him was that at a club level he was good; at State level he was very good; and at Test level, he was brilliant (even though he dropped his first ball in Test rugby when he came on as a replacement against the Springboks at the SFS). In other words, the higher the stakes the better he played. For me, this ability to rise to the occasion has always been the hallmark of a champion. And Matt Burke had this champion quality from the beginning to the end of his career. He’s been hailed by the chairman of the Falcons in Newcastle (UK) as one of the greatest Falcons of all time. 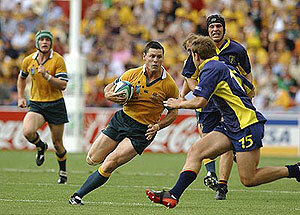 For us, he will always be remembered as a golden Wallaby. We will always remember the soaring goals, searing runs with the high-knee action of the sprinter, the hard-shouldered defence, and the elegance and sportsmanship that defined the Burke magic on the rugby field. Matt Burke, thanks for memories, you were one of the greats.